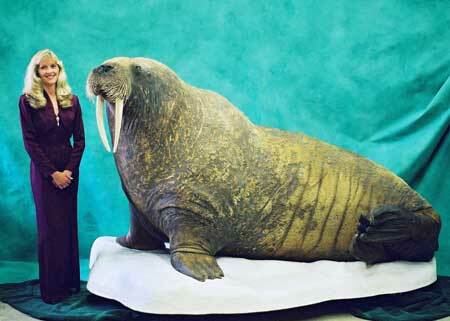 In 1996, a good client requested a price to mount a life-sized Walrus. As a resident of the North West Territories (now Nunavut), he had been selected to participate in the first sport hunt ever conducted for Atlantic Walrus in Canada. I began by researching the availability of forms and found only a single paper form, made for a Pacific Walrus. We decided that in order to acheive the accuracy and quality he desired I would accompany him on the excursion, to obtain reference photos, video footage and measurements. This experience was invaluable as it afforded me the unique opportunity to see the subject animals first hand, at very close quarters. The reference material I compiled disclosed considerable differences between the two main species of walrus. The Pacific are appreciatively larger than their cousins, grow bigger tusks and have a reddish skin colour. The Atlantic are generally a more brownish colour and most have very few, if any "nodules" on their necks. If any of these nodules do exist, they are much less pronounced than they are on their larger cousins. When I returned home, I set about constructing this manikin from scratch. In fact, the only items in the entire mount that I did not build were the eyes, which I had custom painted by Tohikon. First, I wanted to avoid the problems I've encountered with epidermal slip while working on African hides. Second, I did not want to remove the whiskers. Gladly, things worked out well in both instances. After completing the life-sized mount, I decided to construct a walrus shoulder mount form, as we had some to do in our own shop. This resulted in the creation of the Walrus 101 form which is displayed on our forms page. This project proved to be an invaluable learning opportunity, that I'm happy and proud to have been involved with. 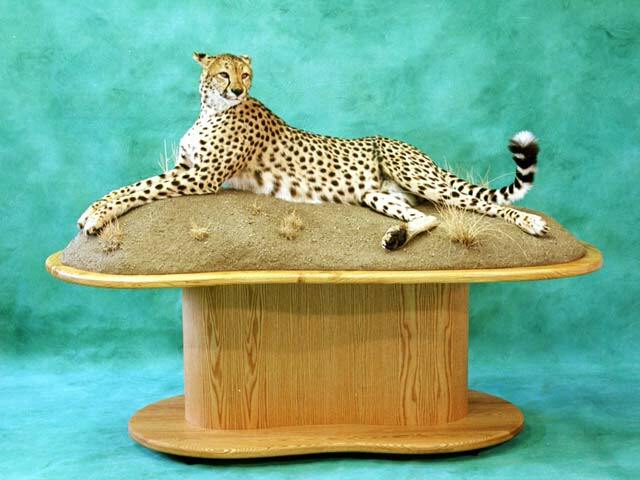 This life-size cheetah project required considerable alterations to the form in order to acheive the desired pose. The pedestal base compliments this piece nicely, it is clearly prominent without disrupting the balance or overpowering the subject. Our ability to accept any new work at this time is limited. However, if you see something on our site that you would like to have done we would be pleased to be of service by offering advice or technical assistance to you and the Taxidermist of your choice in achieving your goals.